On the danger of dog collars. There’s a debate raging in Sweden about whether choke collars are potentially dangerous to dogs. Several influential dog coaches on TV use and recommend them, other experienced dog professionals argue against them. It’s currently causing all kinds of shock waves to ripple across social media, which inspired me for a blog post. I’m not a dog owner – I’ve never owned a dog. I’m guessing that in some people’s eyes, this disqualifies me from having an opinion on the subject. In my view, that just gives me a different perspective. Dog-naïve people, like me, look at dogs and see behaviour without automatically interpreting what it means. We also look at dog owners and wonder why they do what they do. We carry no baggage, as it were. We have a clean slate with regards to How One Should Handle Dogs. In contrast, and I realize this is a sweeping generalization that may offend some readers: I see many dog owners who don’t question what they do, they just continue doing it – because that’s what they learned as a child. They continue perpetuating behavior they’ve learned by observing others interacting with dogs. If you’re lucky and know any geeky biologists, you’ll learn how to determine the gender of the critters, too. Yep. 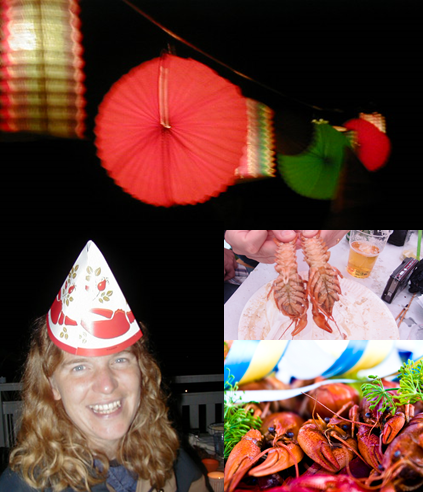 Grow up surrounded by people eating crayfish wearing funny hats, singing silly songs, and drinking alcohol, and you most likely will adopt that habit. Just ask any person from Sweden. Norms are not questioned, they’re typically just passed on to the next generation. Another such inherited behaviour is putting choke collars on dogs: if daddy did it, chances are, you will too. 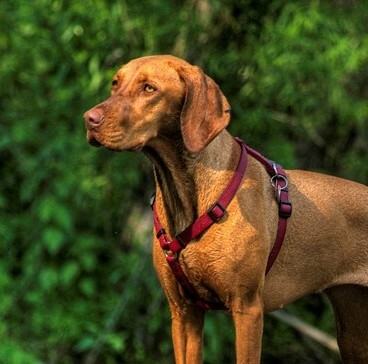 So, in this post I’m offering the fresh perspective: a non-dog-owner’s take on choke collars. What are the potential benefits of choke collars? What are the potential drawbacks of choke collars? Could you obtain the same benefits with another method? If you can’t obtain the same benefits, should you use choke collars anyway? Choke collars can be used to deliver corrections to dogs. Dog pulls, owner jerks leash, dog stops pulling. Apparently, they’re more efficient than ordinary collars because they put more pressure on the neck. Confession: here my impartiality cracks. Sorry for not getting further than the first topic before taking sides. I must say that I find it very disturbing that people have manufactured devices with the sole intention of inducing pain and discomfort in order to change behavior; it’s hard for me to remain neutral. I may not know dogs, but I understand behaviour. Punishment is problematic, to say the least, and I’m resisting the temptation to write more on this topic in this post. After all, today’s post is about collars, not punishment. Deep breath, back to the task at hand. Since dog physiology is not my topic, I enlisted the help of Google Scholar in tracking down some articles studying potential pathological effects of choke collars. Incidentally, the first article on choke collars I found described severe brain damage in a dog that had to be euthanized because his owner had… oh, you don’t want to know. I’m assuming that’s not how most dog owners use choke collars. I’m assuming that most dog owners don’t have the intention of physically hurting their dogs when using choke collars. Nevertheless, in one scientific paper, lesions caused by choke collars were described. In another, I learn that harnesses don’t affect intraocular pressure (that is, pressure in the eyes), whereas collars (any collar, not just choke collars) causes increased pressure in the eyes of dogs, which may in turn lead to eye problems. I found a blog post by concerned veterinarian Peter Dobias, speculating that since collars put pressure on the thyroid gland at the neck, this could explain the range of thyroid symptoms seen in breeds that pull a lot on the leash, including skin problems, ear infections and organ failure. He also talks about severe whiplash injuries seen in the clinic, apparently caused by collar use. In a Swedish study of 400 ordinary dogs, back anomalies were found in 63% of dogs. Among dogs that had neck injuries, 91% had been exposed to harsh jerks on the leash, or had a long history of pulling and straining. It was concluded that leash corrections, the collared dog charging ahead, or a tethered dog hitting the end of a solid line, may inflict spinal injury. 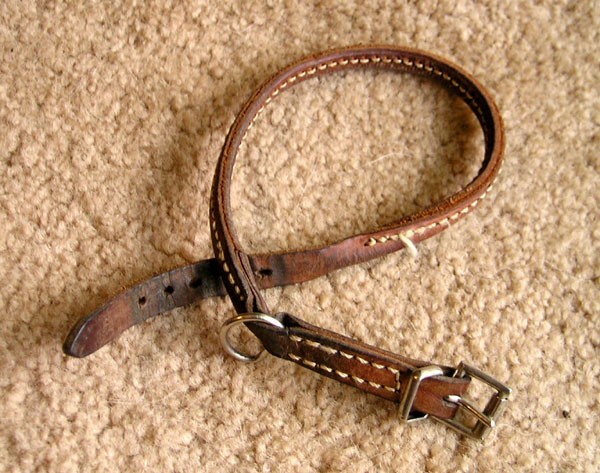 I’m assuming that most dog owners don’t have the intention of physically hurting their dogs when using ordinary collars. I’m a bit shaken, reading these articles. The problem is not choke collars, specifically. The problem is collars. Any collar. There are many types of injuries that could occur, and seemingly just after a few unfortunate jerks to the leash – whether caused by the dog charging forward or by the handler popping the leash, choke collar or no choke collar. It turns out I’m not so naïve, after all. And no wonder, I’ve grown up seeing collared dogs for more years than I care to remember. I’ve become desensitized and numb to collared dogs: it’s the norm. And it takes knowledge to question norms. I’ve cringed when seeing dogs charge forward until they’re suddenly jolted back ty a taut leash, I’ve thought “ouch, that must have hurt!”, but I didn’t realize that they could sustain physical damage. I didn’t recognize that many dogs have neck and spinal injuries, unknown to their owners. I head over to my tribe of dog trainer nerds on Facebook and put up a quick poll. Collars or harnesses, I ask. Within five hours twenty of them have obligingly answered. The majority of these dog pros don’t use collars when leash walking their dogs. The ones that do make a point of stating that you need a very good level of cooperation in order to use collars. 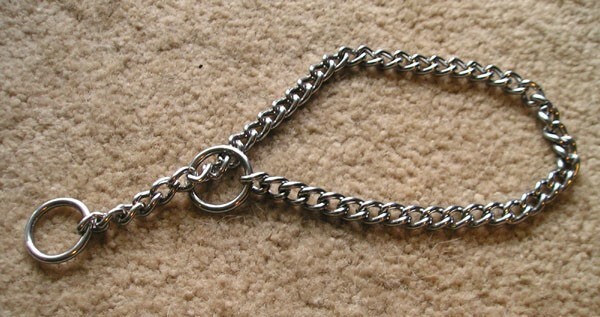 Neck collars are potentially dangerous to dogs if used on a leash. Photo: Elf, Wikipedia. It takes knowledge to question norms. As a non-dog person, I thought ordinary collars were reasonably safe. My fellow professional dog trainer buddies know better, and don’t use them – or are extremely careful when using collars. So are there other ways to get dogs to stop pulling on the leash? At this point in my quest, my original questions change. This is really a two-part topic: it’s about what type of equipment to choose, and how you teach your dog to do what suits you, such as walk on a loose leash. Are there alternatives to collars? As to equipment, as far as I can tell, none of the problems associated with collars have been documented with harnesses. So, changing from collars to harnesses should remove many, if not all, of the risks mentioned above, since they distribute the pressure away from the sensitive neck. Harnesses are safe. Photo: Bryon Realey, Flickr. Dog owners may question my choice of picture. Well, time for a disclaimer. Is that a good type of harness? I don’t know. Is it properly fitted? I don’t know. What breed is that? No idea. I chose an image to illustrate a concept rather than recommend a specific device. Which would be the best harnesses for specific breeds or personalities? Tell us in the comment’s section, below. How do you teach your dog not to pull on the leash? Here I’m back on safe ground. I may not be a dog owner, and I’m unfamiliar with collars and harnesses, but I understand animal training. As to how to teach your dog to stop pulling, there are alternatives to corrections, leash popping and jerking the dog. Animals do what works. If pulling works, dogs will keep pulling. If pulling doesn’t work, they’ll stop pulling. In this short video, Emily Larham at Dogmantics (aka kikopup) illustrates several great principles and tactics of how to train Loose Leash Walking, and towards the end of the video you’ll see her drop the leashes and her two dogs remaining with her – even as she changes direction. Actively train your dog how to behave on a leash. Practice indoors first, without distractions. Reinforce the desired behaviour (walking at your side) by attention or clicks/treats. Change directions frequently – unpredictability makes the dog more attentive to you. To this I might add a twist: when training indoors, teach the dog to stay next to you and follow you without a leash, first. 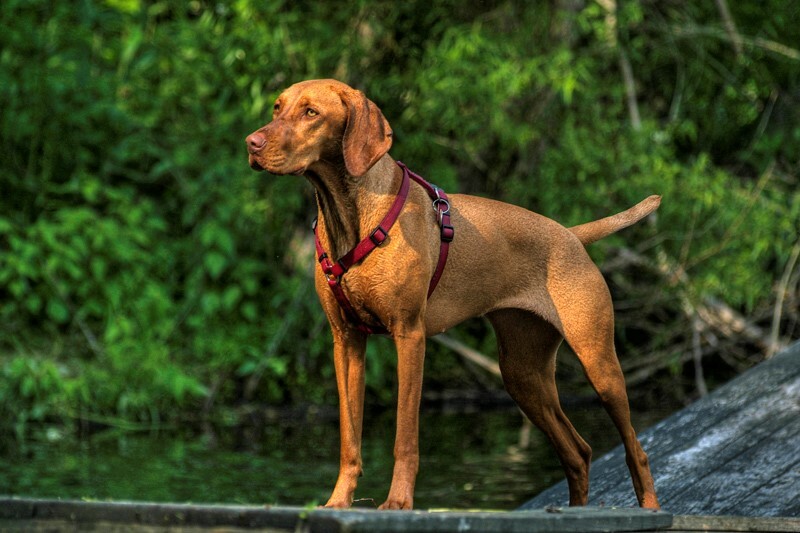 This minimizes the risk of pressure on the leash later: the dog already knows what to do. This started out as a blog post about choke collars, but in the course of writing it I found evidence that any type of neck collar on a leash can potentially cause irreparable damage to dogs. Rather, harnesses are seemingly a safer option. In addition, there are ways of teaching dogs Loose Leash walking that are not painful or intimidating, for instance by rewarding desired behaviour – and no longer rewarding the undesired behaviour. It takes knowledge to question norms. I know now – do you? I teach online courses in foundational and advanced animal training. Wanna be notified the next time a course is available? I’ll also keep you posted on when I give a free webinar, or publish a new blog post. Sign up below! Pauli et al. (2006). Effects of the application of neck pressure by a collar or harness on intraocular pressure in dogs. What about pulling as a emotional response, not as learned behaviour? Good point. And precisely one reason why harnesses would be a better option than collars. If the dog sees something interesting and lunges, the damage won’t be so bad. Then again, you can teach them a little bit of impulse control to reduce the likelihood that that happens. I’ve tried many harnesses with my large dogs, and find that the most humane and effective is called the Balance Harness. Because of the location of the straps, it puts no pressure on the neck and can’t chafe the armpits. It also has both a back and chest ring so the leash can be attached in either or both places. There may be other brands of harnesses with this same design but this is the one I use because it has all the features I need and it’s exceptionally easy to put on and take off. Yes, thanks so much for that article especially when written from a non-dog person which makes it more effective because it is more objective and thinking related rather than with a training mentality or an emotional “love dogs so much” mentality. Dogs do pull less with a harness in general and I just saw proof of that last week when my friend and I put a harness on an 18 month old Bearded Collie who are known for being hyperactive and major pullers. He had a regular flat collar on and was pulling all over the place. When we placed the harness on him, he suddenly seemed to calm down and moved much slower…..the reason was because he was no longer getting all anxious being choked up the whole time, and could actually breathe a sigh of relief and relax. It was amazing…wish we had a video of that. Of course he is not going to not pull at all, but training loose leash with a harness will teach him quicker and deeper than anything that is choking or hurting. I agree with this article. Putting pressure on any collar is a bad idea. The campaign “Collars are for tags” was made for a reason. Unfortunately, even among harness there is debate. I recommend only flat non-tightening walking harnesses like perfect fit or balance. Both have two points of contact s you can use both or either to attach the leash to. I offer online classes that teach you how to loose leash walk to a high level on a harness or for exceptional cases how to properly use a head halter to teach a dog to loose leash walk. They really should only be used with dogs that lunge or yoyo. And their are caveats with their use too. What about ‘gentle leaders’, they work similar to a horse halter? Not recommended as it can also damage the neck and they often ride up on the muzzle and hit the yes, and they prevent normal calming signals that dogs need to communicate to other dogs. It actually is not a “normal” sensation for a dog to be led by the muzzle as they were created to simulate how wolves nuzzle each other or the mother pushes the pups by the muzzle but during a walk this would not be happening the whole time, and it really is uncomfortable! My friend and I tried them on and had to hold it around our nose to have it stay on, but if someone pulled with it on, it jerks the head over that direction and is not a good feeling which is why it may “work” to stop pulling, but not worth it in the long run! I meant to write…hit the eyes….not the yes. Loose leash walking is really key, I agree, and Premack rocks! But I’d still be concerned with the accidental leash jerk on a collar even in a well-trained dog. If you happen to step on the leash. If you for some reason need the dog to come quickly to you and pull him out of danger. If you slip and flail your arms, the leash jerking at your dog. Or if a rabbit runs by within chasing distance… though these situations are not common, they do occur. Thank you so much for this – I just wish it could be seen by a much wider audience! Having been part of the “show world” for a number of years when I was younger I deplore the practice of stringing up dogs in the ring and always asked competitors to show their animal on a loose lead. A dog fit for purpose does not need to be lifted off his front feet to look good! Incidentally, my own animals are always taught to walk with me off lead at home before lead training begins, for that very reason. 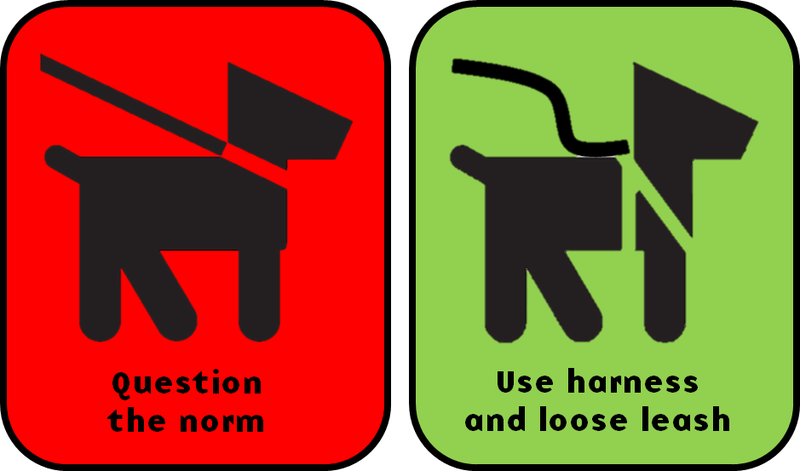 This is a tough question… I have used both collar and harness on my dog, and got back to collar, because it is easy. Just pull it over her head and you are ready for a walk. But I had a talk with another dog ower the other day, and she told me that the dogs will pull more if they wear collars, something around the neck. It can be better to get a harness to stop her from pulling, even if that doesnt remove the behaivor. And I know I need to train her to get her to walk nice by my side. So I will buy a new harness for her. But as I live in Sweden Im well aware of the discussion going on, and I like both collar and harness. I do not like the choke-collar… But I started thinking about the choke-collar. But as you wrote, if my dad did this, I will too. And Im trying to break free from the norm, so for my dogs sake, maybe I should try harder and break free from the collar-norm too! Interesting, that collars lead to more pulling than harnesses…! Amazing that harnesses aren’t allowed in dog competitions, I can’t imagine why not? A very good point about people not questioning norms. It’s one of the most important skills to teach not just children but adults as well: Critical thinking. As for dogs straining on collars, things are slowly changing. Anything that contributes to raising awareness of harmful techniques and equipment in dog training is highly welcome – like your article. So, thank you. Previous PostPrevious How to become a better animal trainer.